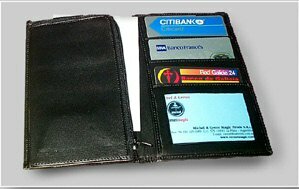 Over the years many novel types of wallets have been produced for magical uses but here is one best method to produce one of the most amazing effects. This wallet is made of extra fine leather by expert craftsmen thinking in the professional and serious performer. The Le Paul/ Jennings Wallet allows you to make travel cards coins bills rings or billets inside a sealed envelope which was into a zipped compartment of a fine leather wallet. It is excellent for parlor or close up magic and it is manufactured by the most experienced craftsmen. This is a specially made wallet by expert craftsmen. -It has the right size.